The United States Congress designated the Lime Canyon Wilderness (map) in 2002 and it now has a total of 23,710 acres. All of this wilderness is located in Nevada and is managed by the Bureau of Land Management. Outstanding vistas of Lake Mead and the Muddy Mountains can be found in this remote area. 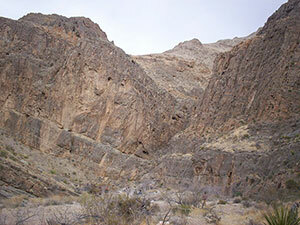 The Lime Canyon Wilderness is located east of Las Vegas, Nevada. Lime Ridge dominates this Wilderness and trends north-south reaching an elevation of 4,406 feet. This area contains rugged drainages and gently rolling hills, paralleling ridges, and sandy washes. Faulting and erosion have exposed a variety of sedimentary deposits. The rugged ridges and rolling hills of this intriguing backcountry destination provide opportunities for quiet solitude, which becomes more apparent the deeper into the wilderness you venture. Infrequent visitor use and the need for route finding skills provide great opportunities for solitude and recreation including hiking, horseback riding, hunting, exploring, and camping under the night sky. Lime Canyon Wilderness is dominated by Lime Ridge, which is composed of older Cambrian through Pennsylvanian carbonate rocks. The wilderness area's namesake, Lime Canyon, cuts through the Wilderness as it drains west to the Overton Arm of Lake Mead. The canyons and bajadas which overlook the Overton Arm of Lake Mead sit at about 1,475 feet. South of Lime Canyon, you can find some Precambrian metamorphic rocks. Lime Canyon Wilderness is a sparsely vegetated Mojave Desert scrub environment with creosote bush, white bursage, Joshua trees, catclaw acacia, Mojave yucca, Nevada jointfir, and barrel cactus scattered across the landscape. Arrowweed, paperbag bush, indigo bush, and buckhorn cholla can also be seen. With a watchful eye you may be able to spot black-tailed jackrabbits, desert cottontail, desert woodrats, white-tailed antelope squirrels, side-blotched lizards, and slow moving desert tortoises. Planning to Visit the Lime Canyon Wilderness? How to follow the seven standard Leave No Trace principles differs in different parts of the country (desert vs. Rocky Mountains). Click on any of the principles listed below to learn more about how they apply in the Lime Canyon Wilderness.